How Can I Power A Pre-AC/DC Converted Computer Monitor Using A 12V LiPo Battery? I have finally found the last needed piece of my FPV set-up (someone was throwing it out). 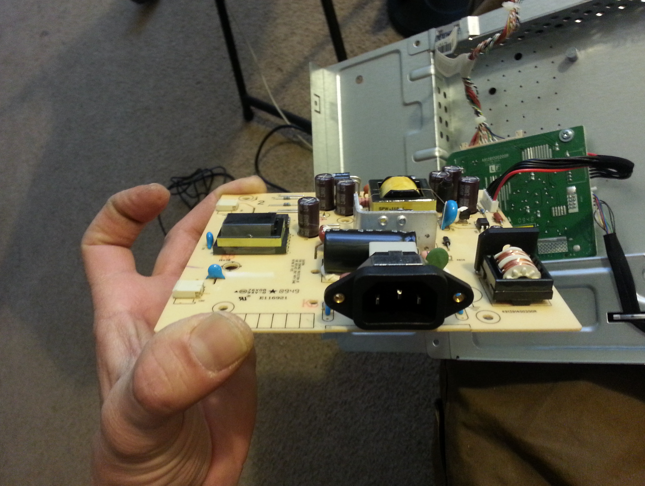 However, the power cord is not a converter type power supply, but instead a three prong direct 10A 125V cord, so I assume the converter is internal. If anyone could instruct me how to modify it to be powered by my 12V LiPo power source, I would greatly appreciate it. On the data panel of the charger, what does it list as the output? The other option is to do a inverter. Then wire up a a cigarette socket to your battery connector of choice. I'm not sure what charger you are referring to? As for the inverter, I had considered that, and just using the power from my car battery to flying from right outside of my vehicle, but your cigarette plug idea may give me the mobility I was wanting in the first place. I would still like to keep this is a last resort though. 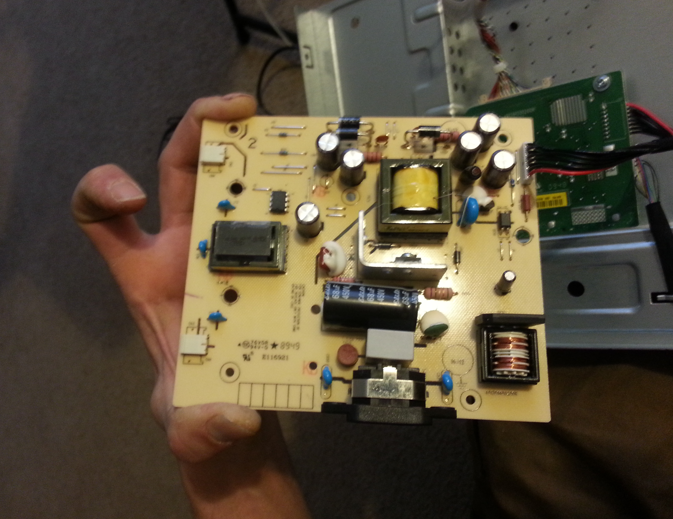 Simplest would be a cheap little inverter keeping in mind amp requirements for LCD. Great use for those hobbyking b grade lipos, 5000mah.Would also buy a cheap little balance plug voltage checker to leave on lipo while LCD is in use. The cheaper, cleaner option would be to find on the board where power is regulated down to 12vdc....if even 12v...it could be 5v, 7v or 9v and direct connect to that point bypassing 110vac input altogether. This would be far more technical though with the downside of possibly blowing something up. Hmmm... That's a bit more than I expected to see (I'm a tinkerer, not an engineer). I'd go with FlyingMonkey's method as I wouldn't want to break your stuff. Sorry, but I have a few more questions... The monitor has "AC100-240V,50-60Hz,1.2A(1,2A)" on the back. I already have a Black & Decker inverter that has an output rating of 115V AC, 60Hz. 100 Watts (It also says "CAUTION: OUTPUT NONSINUSOIDAL.") Could that be sufficient for this monitor? Do you have a max amp rating on that inverter??? Course if I wasn't so lazy guess I could do the math....ugh 115vac x 500watts = 4.3 amps....yup you are good at 1.2amp LCD draw....but keep in mind those cheaper inverters although capable of 500watts and labeled as such come from factory with a 2-3amp fast burn fuse or trip so idiots won't blow the inverter up and return it under warranty. But here is the catch and this is an area I hope someone with more knowledge will step in....1.2amp at 115vac is pretty high when converted over to 12vdc supply. Every way I try the math I come up with 12-13amp DC including inverter latent requirements.....that seems awful high to me....13amp sucked from lipo supply....that means a 5000mah minding 80% rule will be outta juice in 18min. The NONSINUSOIDAL caution is common boilerplate on all those inverters....has to do with sine waveforms....lots of complexities that aren't worth a fuss. Thanks to everyone for trying to help (and to lonewolf7717 for doin' the math). I think before I spend the money on a new more powerful inverter, and lighter plug, I will just pick up a cheap new monitor that has the converter type plug already for simplicity's sake. One final question though, when shopping for my new monitor how will I be able to determine if it is the type that switches to "The blue screen of death" or not? Is there a term that might be in the description for the proper type of monitor? Sorry for bringing this up again. 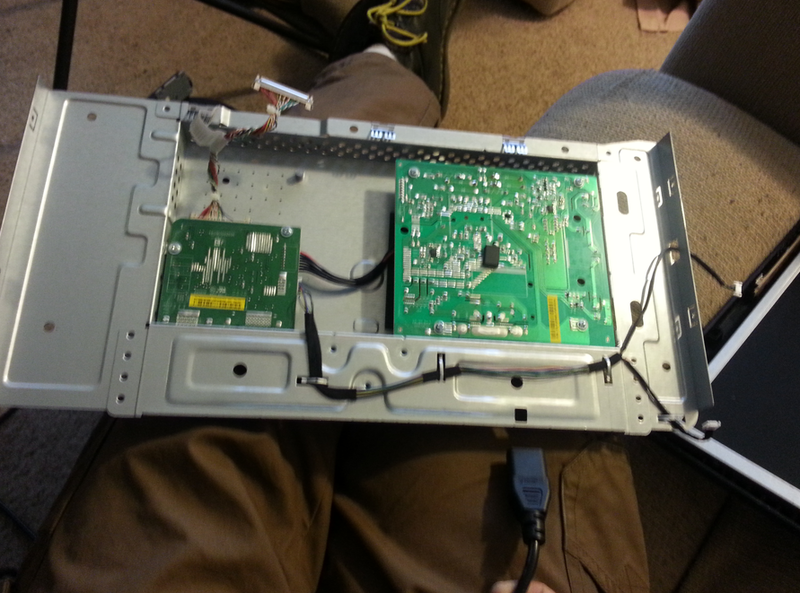 But alot of people are asking how to convert a monitor from AC to 12v. 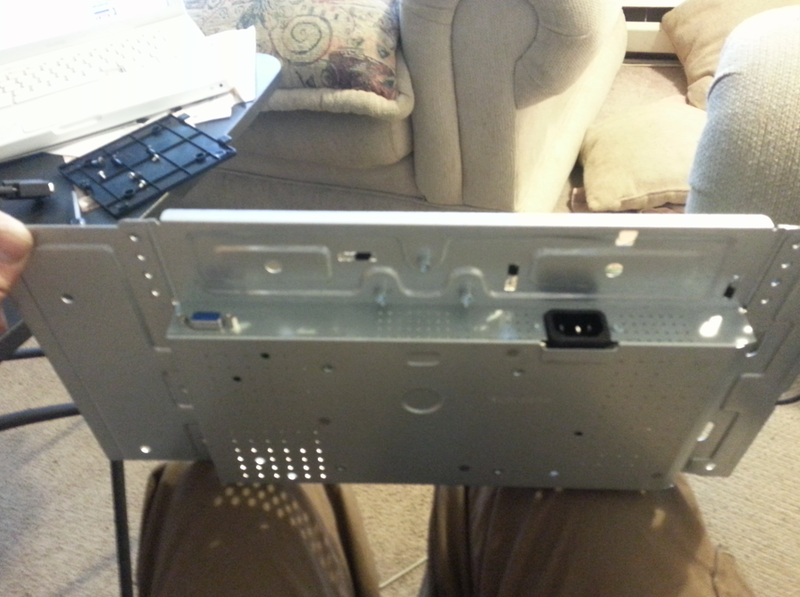 For LCD Screens, look for this parts on ebay. Its a smart and cheap way to convert your monitor to run it on lipos.